Ever Read “My Ishmael” by Daniel Quinn? You may not agree but I have had fuzzy thoughts that this may be the root of a lot of the evils that have befallen the Human Race… And don’t we call the life that the “primitives” that we see on National Geopgraphic and Discovery live “Idyllic”? Remember Article 1 Section 2 of the Constitution! One-Fifth of an American…How much is an immigrant’s life worth, exactly? How do you justify a border fence? Why is it OK to consign millions of unskilled Mexicans to lives of desperate poverty? I’m told it’s because Americans should care more about their countrymen than about a bunch of foreigners. OK, but how much more? Surely there’s some limit; virtually nobody thinks, for example, that Americans should be allowed to hunt Mexicans for sport. So, exactly how much are you willing to hurt a foreigner to help an American? Is a foreigner’s well-being worth three-quarters as much as an American’s, or half as much, or one-quarter as much? In other words, to justify keeping the immigrant out, you’d have to say he’s worth less than one-fifth of an American citizen. By contrast, there was a time when the U.S. Constitution counted a black slave as three-fifths of a full-fledged citizen. Alabama Gov. Bob Riley has recently apologized for the ravages of slavery. How long till politicians apologize for the ravages of our restrictive immigration policies? 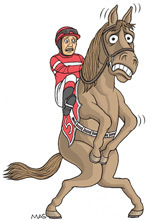 Does a Racehorse Really Pee Like a Racehorse? The third leg of horse racing’s Triple Crown takes place on Saturday, with the running of the Belmont Stakes. Around 60,000 fans will be watching in Elmont, N.Y., as they put down beer and the track’s signature cocktails. Needless to say, they’ll probably be peeing as much as the racehorses. Wait, how much does a racehorse pee? A lot. Horses typically produce several quarts of urine every four hours, for a total of about 1.5 to 2 gallons per day. (By contrast, an adult male human pees 1 or 2 quarts per day.) The stream, usually one-third to a half-inch in diameter, can last up to 30 seconds. In general, the larger the animal, the more it pees. A Clydesdale, for example, weighs twice as much as a Thoroughbred and produces urine in greater volume (and with a more pungent smell). An average pasture horse that spends its day grazing might also beat a racehorse in a peeing match: Pasture grass contains a lot more water than the carefully prepared grains and pellets fed to racehorses.